I bought a few for experimenting with, and one for replacing the touchscreen in my sons' Nintendo DS, as that touchscreen has developed problems. That connector is tiny as! To give you an idea of scale, the touchscreen ribbon cable you can see in the lower left is 2.5mm across: Just 1/10th of a inch! Without the lid, the connector doesn't push down on the touchscreen cable, and the touchscreen doesn't work. What to do? Without a working DS, my kids will kill me! 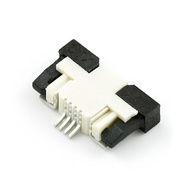 I thought of trying to hot-wire the touchscreen cable to the board, either directly or via four tiny wires, but I couldn't think of a way that wouldn't risk damage to the PCB, so I decided to buy a new connector. Although the shape is different, they are only about US$1 each, so I bought a few. Actually, I bought them from SparkFun's local distributor, Little Bird Electronics. 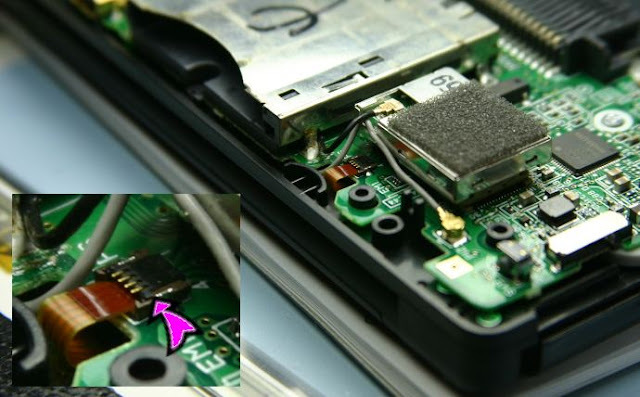 The connectors arrived in about a week, and when I got them, I noticed something rather unfortunate: The connectors on the Nintendo DS PCB are designed to have the contacts on the touchscreen facing down, whereas the SparkFun connectors are designed to have the contacts facing up. I don't think that's going to work! In order to confirm this, I spent more than two hours at our hackerspace, soldering wires onto those four pins under a microscope. And yes, that connector is the wrong way around and not suitable.